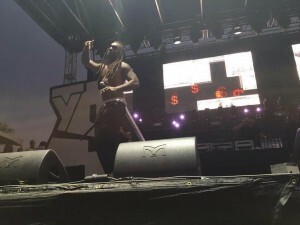 Friday night Ty Dolla $ign brought the energy to TBD Fest, garnering a sizeable crowd at the Jukely Stage. Draining a fifth of Jameson, Ty Dolla $ign started off his set with a few tracks off his mixtapes $ign Language and Beach House 2. For a short bit, Ty Dolla $ign even brought out a bass guitar to showcase his other artistic talents, and the crowd responded positively. Out of all the other rappers to perform at TBD, Ty Dolla $ign was the most engaging with the audience. Stage diving several times, he got as close as possible to his many fans. Gazing from the photo pit towards the crowd closest to the stage, it seemed that his most fervent fans were also some of his youngest. Everybody went absolutely insane when he dove in, and his body guard was up with a real challenge fishing Ty Dolla $ign back out. He spent more just as much time having fun with the audience as he did performing. The peak of his show was when Blasé came on, the infectious hook reverberated with the audience with Ty Dolla $ign spending a decent amount of time in the midst of the crowd. He ended his set off with shouts out to Taylor Gang, taking a picture with the crowd, and mentioning his soon to be released album, Free TC. – Simar Singh. Tyler’s was the last Hip-Hop set of Friday night. After joining the crowd to mosh during Death Grips’ performance (the KDVS Boyz were in hiding at this point), Ace took to the stage joined by his hype man and Loiter Squad co-star, Jasper, and his beloved tour DJ, Taco. He opened with “Deathcamp”, the intro track off of his latest full-length, Cherry Bomb. The N.E.R.D-inspired jam got the crowd pumped and ready for more. Next, he ran through a few of his pre-2013 hits that launched him and the Odd Future collective into internet stardom. He played “Sam Is Dead”, “Tron Cat”, and even “Yonkers” (a rather juvenile track he’s previously tried to distance himself from). He also performed most of the fan favorites from his third album, Wolf, including “Tamale”, “Bimmer”, “Domo23”, “IFHY”, and “Jamba”. All while pantomiming in sync with the various elements of each instrumental. The Tyler diehards in attendance were decked out in their colorful socks and snapbacks, straight from the OF web store. A handful of the kids around me knew most of the lyrics to even Tyer’s older material. He was passionate throughout his 45 minute set, but was clearly all business. 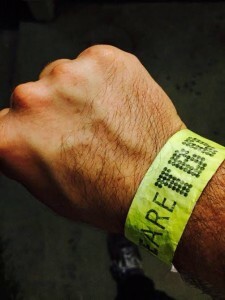 He effortlessly reached through his catalog while catering to the festival crowd. After a few songs he still found time for some of his famous onstage antics. He stopped the music and let his fans shower him with gifts. Some threw homemade signs on stage, others tossed Odd Future merch in hopes of getting their gear signed. One young fan presented Tyler (an admitted asthmatic) with a new Albuterol inhaler. In response, Tyler looked dead at the kid’s mom and exclaimed, “You birthed an amazing motherf***ing child, lady.” – Isaiah Rashid. With only half of the infamous duo, Prodigy began his set off with several tracks from their sophomore album The Infamous. Even with the absence of Havok, the accompanying DJ worked around that restraint and kept the vibe going. With only one other stage occupied by an artist, it appeared that most of the festival goers were around the Jukely Stage for Prodigy’s performance. While the small portion of the crowd that had shown up early in anticipation for Mobb Deep’s performance appeared to rap along with the songs, it appeared that most of the festival attendees were unfamiliar with the NY duo and uninterested in the classic east coast sound they had to offer. This however did not deter Prodigy’s performance; his DJ definitely helped keep the crowd engaged. With a crowd that appeared to not know Mobb Deep, I was wondering if people would even know the words to “Shook Ones”. As soon as “Shook Ones Part II” came on the crowd seemed to be completely revitalized with decent amount of people rapping along. It was reassuring to know that this classic track was still relatively popular with the young audience attending TBD. Prodigy ended his set off with a few tracks from Albert Einstein, his collaboration album with The Alchemist. Compared to the other hip-hop acts performing at TBD, Mobb Deep seemed a bit out of place as something that would appeal to an older crowd rather than the young festival goers that were attending. – Simar Singh. Capping off an electrifying Saturday night was Chance The Rapper and the Social Experiment. The band is gearing up for their upcoming Family Matters tour, and decided to make a stop at TBD. 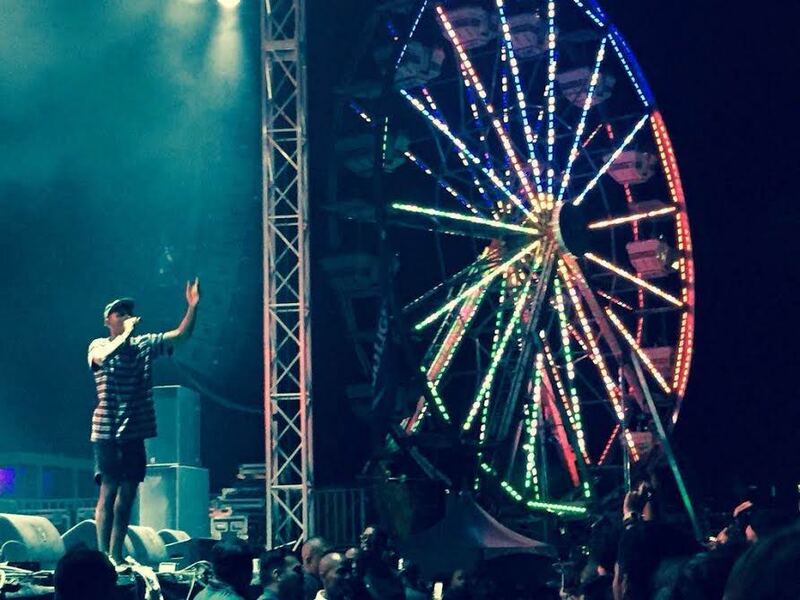 Porter Robinson was supposed to headline Saturday, but Chance stole the show. Everyone at the festival came to see the Chicago native and his set even ran a little late. Being the nerd (and Chance The Rapper stan) that I am, I was familiar with his festival set; I watch the recording of his Lollapalooza performance at least once a month. As per usual, the band fired up the crowd with a series of call-and-response hooting noises. Once the fans were silent in anticipation, Chance glided across the Jukely stage and cued the SoX gang to start the music. He opened with “Everybody’s Something”, the sentimental track from his sophomore mixtape, Acid Rap. After a few more songs, he stopped himself and apologized for not properly introducing his band. The spotlight shined on the members of the Social Experiment; Stix, Peter Cottontale, Nate Fox, and Nico Segal a.k.a. Donnie Trumpet. The band backed Chance on more Acid Rap cuts, but also got to perform some of their debut album, Surf. 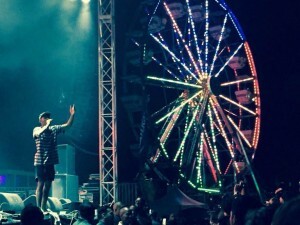 Chance and the band pleased the crowd with “Smoke Again”, “Pusha Man”, “Paranoia”, and the viral hits, “Juice” and the aptly-titled “Favorite Song”. He also performed verses from his feature spots on a few of the summer’s best rap entries, including “The Way” by Kehlani, “Planes” by Jeremih, and “Baby Blue” by Action Bronson. Near the middle of the set, Chance asked the crowd if we were familiar with his first project, 10 Day. He was met with a roar and immediately went into a two song medley of “Hey Ma” and “Brain Cells” from the mixtape. To finish the night, Chance sent us off with the anthemic “Chain Smoker”. While on the way to Porter Robinson’s set, everyone was chanting Chance’s lyrics and echoing hoots. – Isaiah Rashid. 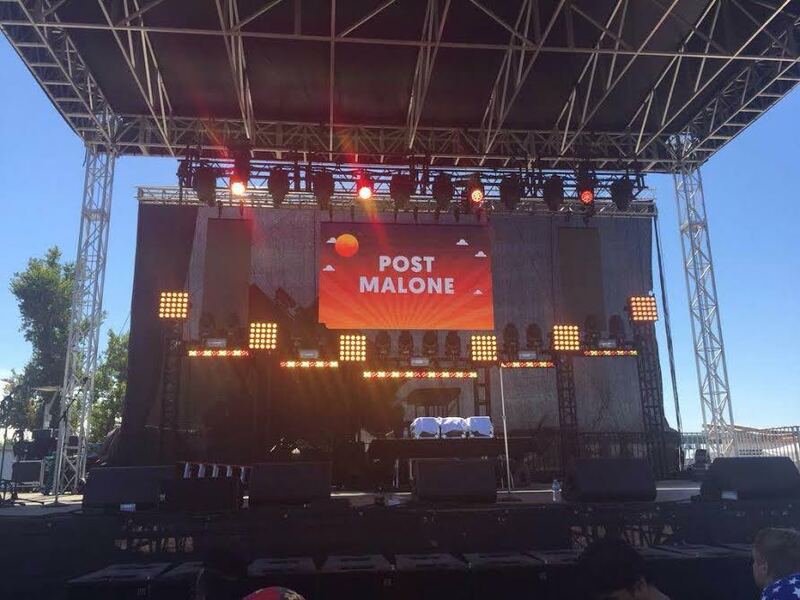 One of the final hip-hop acts to perform was Post Malone, an up and coming rapper hailing from the 3rd coast, Texas. Post Malone, like most new rappers, found his fame through the internet after releasing his song “White Iverson.” Following in the footsteps of others incorporating nonconventional R&B vocals, such as Fetty Wap and ILoveMakonnen, White Iverson incorporates a catchy hook with a simple instrumental. Post Malone, lacking both an album and a mixtape under his name, performed only a handful of songs. Performing earlier in the day, Post Malone had a small crowd surrounding the Jukely Stage. He started his set off with “White Iverson” and ended it off with the same track. Between those two iterations of “White Iverson”, Post Malone a handful of songs from his Soundcloud, most of which were produced by the production team FKi. Taking a departure from his fellow Texan rappers, Post Malone’s music does not have the typical drippy codeine influences coming out of H-Town. – Simar Singh.